Do I have to pay for updating to latest version? What hardware does it support? Does it support our currency? Yes, UltimatePOS is translation ready. Do you support the item? Does it supports GST / VAT taxes? The tax is completely customizable. You can define GST, VAT and Group taxes like a combination of CGST + SGST. 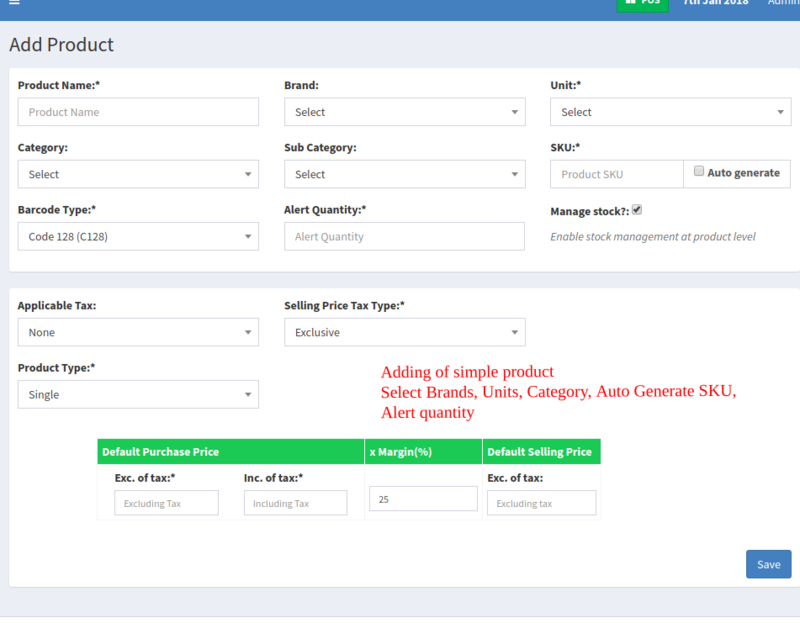 This taxes can be selected while adding purchase & sell. You can view the tax report to view details of input & output tax during a period. IMPROVEMENTS: Product description field added in Add/Edit Product. Quick add products & Product import using csv. NEW: SMS notifications support for ALL countries SMS providers with RESTFul API Support. NEW: Import customer using csv file. IMPROVEMENTS: Setting screen redesigned to easily manage settings. FIX: Adding opening stock issue from product list. FIX: Product list showing same product multiple times. IMPROVEMENTS: Customer screen Action: Pay Due amount for multiple invoice at once. NEW: Credit Limit amount added for customers (with 0 = no credit, blank values = infinite credit). NEW: Inline/each product discount Fixed/Percentage in sell screens. NEW: Theme color options added. IMPROVEMENT: Unit price and tax moved to modal in sell screen. IMPROVEMENT: Option to display salesperson in invoices. IMPROVEMENT: Ajax Base path improvements. Fix release for V2.4 . 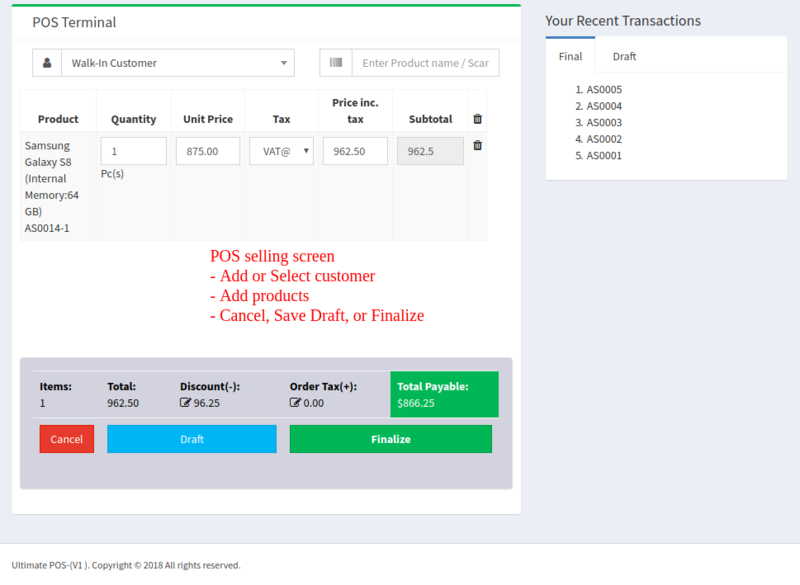 Quick Add Suppliers & customers from Purchase or Sell screen. View Purchase, Sell in the same page (click on the rows in Purchase list or sell list) without going to a different page. Added field for website & 4 custom fields in business locations. Fields also displays in invoice. Bug fixes with Opening stock. Convert quote to final invoice. Adding of “Lot number” of items while purchasing. Adding Rack Details of a product. New layout – works super excellent in full-screen mode. Product Suggestion based on category and sub-category. IMEI or Serial number for Mobile & Electronics stores . Classify Customer into Groups and sell at different prices ( Retail customer, Wholesale customers ). 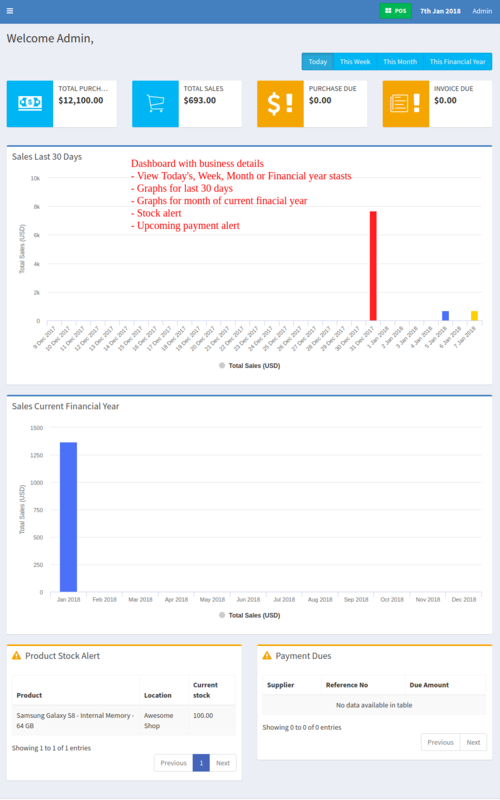 Customer Group Reports. 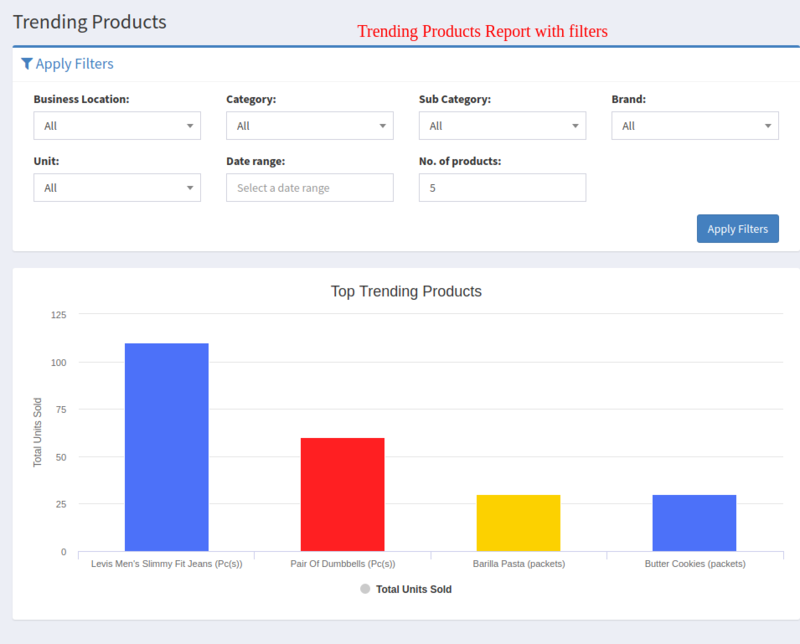 New Reports added: Product Purchase report, Product Sell report. Contact ID added for contacts. HSN code support for GST countries like India. Sales commision percentage to automatically calculate commissions based on the sales. Thermal printer invoice layout improved. Remove expired product from expiry report. Remove compulsory from Tax field. Stock Transfer between different business locations. 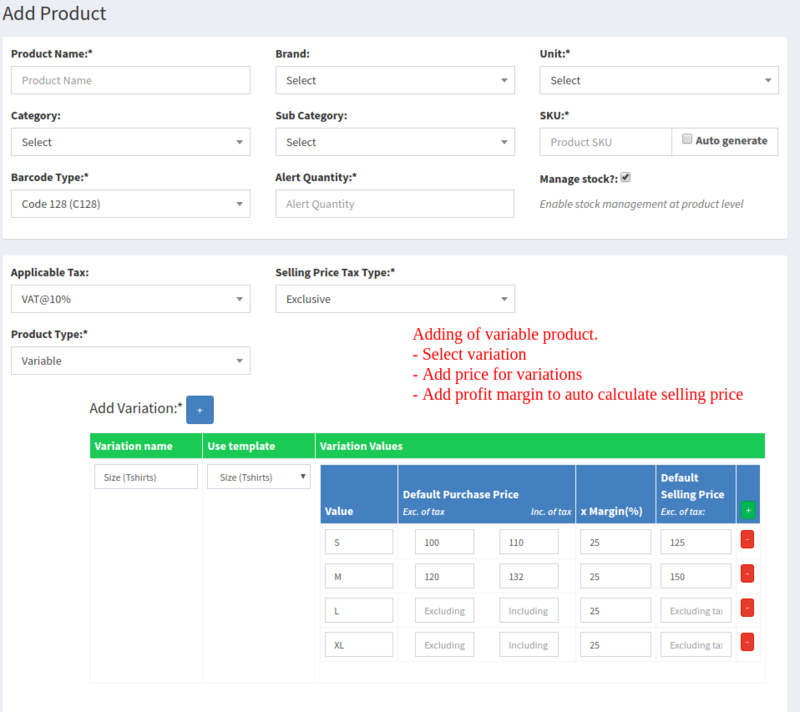 Adding/Editing of Opening Stock in Add/Edit Products. Assign One or Multiple locations to a user role. New reports added: Expense Reports, Cash Register Report, Sales Representative report.